Facebook has the potential to reach thousands of people within minutes and is a must-have tool for restaurateurs. Apart from being the go-to place for viewing hilarious cat videos, Facebook allows you an excellent opportunity to convey your restaurant’s brand in a social and informal way. For instance, you could give diners a taste of your venue’s atmosphere through rich video and picture content. Once you have them interested in your content, you can serve them the next online course by directing potential customers from your Facebook page to your website; driving additional bookings for your restaurant. Let’s start with the basics: what customers see when they land on a Facebook page. When it comes to the following sections, you need to be clear and informative to immediately catch the customer’s eye. The profile picture – Your profile picture appears everywhere on Facebook. Due to this, it needs to be instantly synonymous with your restaurant. We suggest a high quality image of your logo, easily identifiable from a small thumbnail. The cover photo – Your cover photo should be colourful, eye catching and give people an insight into what’s on offer in your dining room. 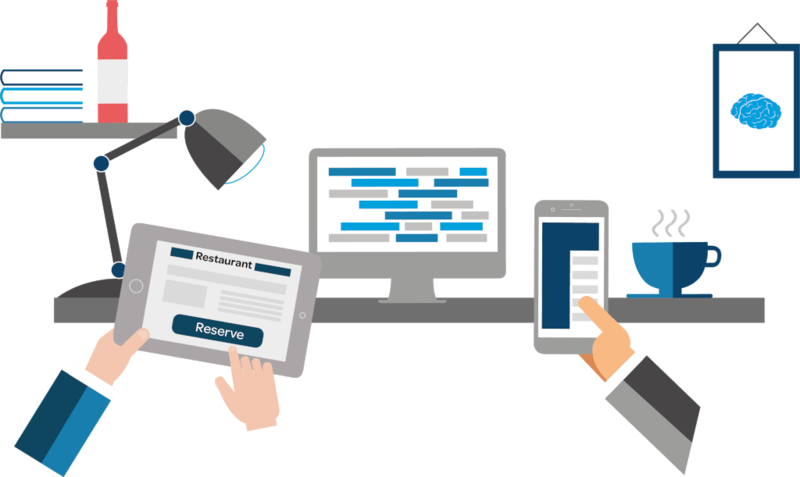 The About page – Make sure this is jam packed with all your info – from descriptions of your restaurant – to contact details and booking links. Call to action – Adding a booking link in the call to action section will make it easier for potential customers to book straight into your venue. The Spanish Butcher is a steak restaurant in Glasgow with modern, New York-loft style interiors. Their page is a great example of a good quality profile picture and colourful cover photo. The food looks inviting, delicious and the profile page is in-keeping with their brand. They have added a call to action button to let customers know exactly where to make a reservation. Facebook tabs are an additional way to get the information that you want to promote in front of the people who land on your page. Admins or Editors of the page can manage and reorder these according to your business goals. As a restaurant, you want to maximise your opportunities, guiding people towards a booking. Having the tools laid out will make that much easier. Looking at Scottish restaurant Cail Bruich, they have laid out their tabs well. It’s easy for people to book at the restaurant, buy vouchers and receive additional communications through their business page. When posting, you need to keep your goals in mind; what are you trying to achieve from your posts? Be wary of posting hoards of irrelevant content as this can become spammy and make people head for the unfollow button. Looking for inspiration on what to post? Here are a few ideas on what content to post for your audience. Behind the scenes content – This could be in the form of videos of the chef at work, an interview with the chef or a sneaky peek at upcoming projects. You don’t need expensive equipment to do this, most smartphones have great quality cameras now. Ask questions – A poll asking your audience to name a new meal/drink on the menu is a great way to get a two-way conversation going. Recipes – People love you for your food, give them some recipes that they can try for themselves. Share relevant content from other sources – Has your restaurant been featured in an article or publication elsewhere? Share this on your page and highlight your achievements. This can help create brand loyalty amongst consumers and can help encourage shares. Link blog posts – Do you have a separate blog that you update regularly? Increase traffic to your blog page by sharing some content to your Facebook page. Have fun – remember it’s a social network. What’s the point of being sociable if you can’t be fun with your audience? Try posting short videos showing your staff or your venue. You can even show a behind-the-scenes look at the kitchen. Join in with viral trends like the mannequin or ice bucket challenges. Seasonal content is always a winner – you know how we all love the John Lewis Christmas advert? These are a really powerful tool and a great way to showcase the experience of your restaurant online. A photo carousel allows you to display your finest images giving some variation to your feed and tempting online bookers. Showcase new or seasonal dishes. Tell a story e.g a typical day in the restaurant. Include recipes like 5 Steps to the Perfect Pizza or Quick and Easy Spaghetti. Add pictures of a group enjoying a delicious, private banquet, encouraging private dining room bookings. Remember, when you hover over a carousel image, you can add a link. You can even edit the title and description of the link e.g “Book now to get 20% off” or “Click to book our private dining room”. Use this to direct people to your website or your booking widget and increase those reservations. If you’ve followed our guide this far, you’ve hopefully picked up some great Facebook tips. From basic settings and utilising tabs, to ensuring your page looks as captivating as possible, there’s a wealth of information on optimising your profile. Next week, we take things a step further. We’re focusing on visitor interaction and how you can grow your relationship with your customers, translating likes into reservations.